Were These The Offending Lyrics? We've all been there. You're at a party, a bit liquored-up and dancing like a loon. 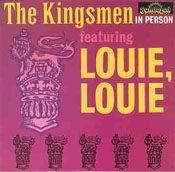 Then "Louie Louie" starts to play and, suddenly, you're one of the Kingsmen. You're howling the lyrics when, during the third verse, you realize that you don't know the lyrics. Well, J. Edgar Hoover once found himself in a similar predicament (sort of). In the early-1960s, the FBI boss and his troops investigated whether the song's lyrics violated federal obscenity laws. Triggered by complaints from parents and other tightasses (who sent the FBI copies of the supposed "Louie Louie" lyrics), the G-men struggled to determine just what it was the Kingsmen were singing. But even when they slowed the 45 rpm single down to 33-1/3, the agents remained stymied. This was one case Hoover's boys couldn't crack.